Could Your Skin Problems Be Exercise-Related?  Home / Skin Care / Acne / Blemish-prone / Is your exercise routine causing your skin problems? Is your exercise routine causing your skin problems? We all know exercise is great for your mind and body, but while we’re often told it also helps promote healthy skin – the breakouts, chafing and other pesky skin problems it can bring sometimes suggest otherwise. The fact is, all that sweat dripping down your face can lead to a hella confused complexion. The good news? We have the solutions (so you’ll have no excuse not to work out!). You might have heard that wear and tear from vigorous exercise like running can break down your skin’s collagen, leading to sagging skin and wrinkles. This hasn’t been scientifically proven – but if you’re particularly worried about premature ageing, a more low-impact activity might give you some peace of mind. Go easy on the running and try yoga, Pilates, swimming or power walking. 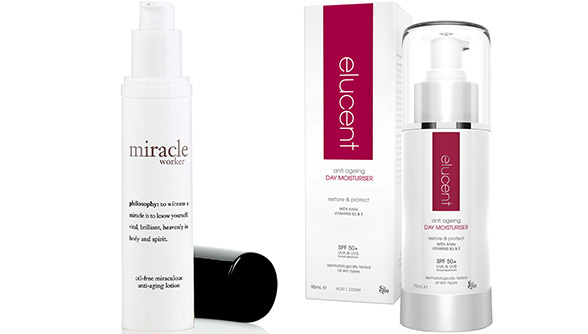 Oh, and don’t forget to supplement your anti-ageing exercise with a suitable skin care product, such as philosophy miracle worker anti-aging lotion or Elucent Anti Ageing Day Moisturiser SPF 50+. The sweat, oil and dirt produced during high-intensity workouts can promote #nextlevel breakouts, especially around your chest, face and back. To reduce the chances of this happening, avoid wearing make-up when exercising and cleanse with a gentle wipe such as Dove Face Care Beauty Cleansing Wipes or Simple® Micellar Cleansing Wipes straight after your workout, particularly if you can’t take a shower straight away. Light, breathable clothing is essential if you’re prone to bacne (aka back acne). Why? Well, polyester and other man-made fabrics tend to get wet with sweat, clogging up the pores on your back quicker than you can say ‘breakout’. Thankfully, there are plenty of newer, more advanced fabric options to help wick the sweat away from your skin. 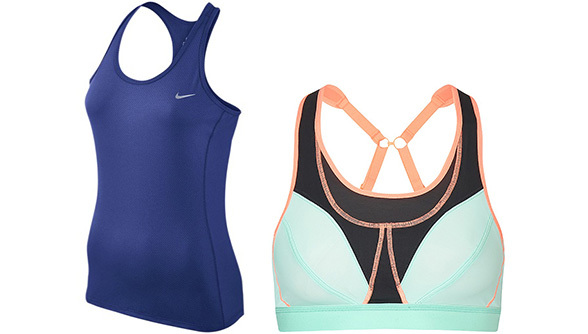 #Treatyoself to a tank top such as Nike Dri-Fit Contour ($55, nikestore.com.au) or a sweat-proof sports bra such as Sweaty Betty Ultra Run Bra ($75, sweatybetty.com/au). Whether you’re outside or indoors, you’re almost always being exposed to UV rays when you exercise. Yep, even running on the treadmill by the window at the gym puts you at risk. The fix for this isn’t hard: wear protective clothing and a hat where possible, and always apply sunscreen to exposed areas – especially your face and the back of your neck! 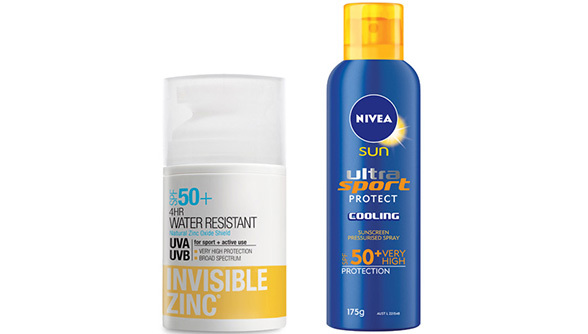 Opt for a heavy duty, sweat-proof sports sunscreen such as Invisible Zinc 4 Hour Water Resistant SPF50+ or NIVEA Sun Ultra Sport Protect Cooling Aerosol SPF50+. If you ask me, this one’s the absolute worst skin issue of all (it’s certainly given me much grief over the years). Caused by chronic rubbing of your skin on either skin or clothing, chafing can be incredibly irritating. 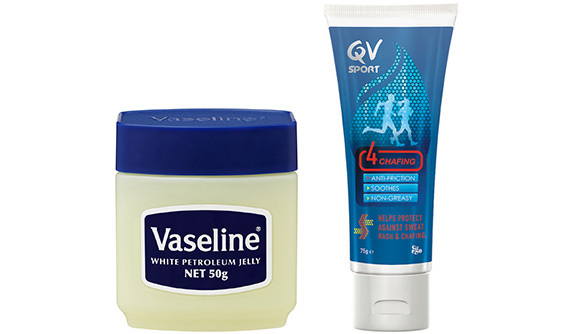 Prevention is better than a cure in this case: use Vaseline Intensive Care Petroleum Jelly or a product formulated especially for chafing such as QV Skincare Sport Chafing Cream on chafe-prone areas before your workout to help stop the rubbing, and give your skin great #glidegame. Are you struggling with any of these exercise-related skin problems? Do you have any other good tips for taking care of your skin when you work out? Are you accidentally ruining your skin? I've always suffered from bacne. It only clears up in summer when I swim in salt water. Such a good refresher, handy tips and tricks. I didn't know that Dove made cleansing wipes. Chafing is why I don't complete full-on excercise, just fast walking and excercises which does not require fast movements ie running etc. No cream / ointment helps with chafing, I hate having a body shape where I have massive thighs which I cannot shift. I've never been one to wear makeup when exercising but I guess each to their own. Great article - I don't work out too hard these days but I just keep up my walking and surfing and swimming a bit in summer too. I don't have any of these problems.... Only because I don't work out hard enough. I'll be more focused on the fabric next time I go out shopping for workout clothes. I also take a shower at the gym right after my workout because I can't stand being in my sweaty clothes for too long! Runners face!! Haha! So happy I opted out of running years ago! Plus my ankles, hips and knees are very grateful too! Chafing was a problem to me when I used to go to the gym especially on my face as I use to rub my face quite often with a face towel due to sweat. I used to literally wait to splash some cold water to relieve the irritation. Ha ha!!! Runner's face!!! Ha ha!!! runner’s face? That's a new one. I thought this would come under the heading of Ageing or Gravity. I dont work out so not an issue for me. I wish I was a runner though. Sadly my body says no.